Andes Candies! Growing up, every time my mom hosted the neighborhood ladies card club group, Andes Candies would appear in the formal living room candy dish. Oh how I loved those candies. I always had to not-so-patiently wait for the Monday evening card party to end before I could have any. OK, so maybe I was the kind of kid who would sneak one or two and then 'rearrange' the candies to try to hide that they had been pillaged. But on Tuesday morning, there was no need for stealth. 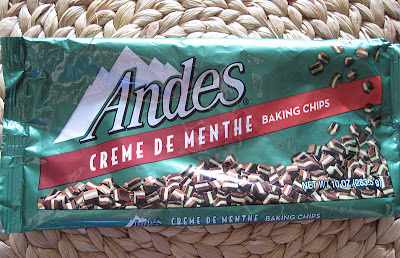 I was pretty excited when I saw the Andes Candies baking bits. I love chocolate & mint. 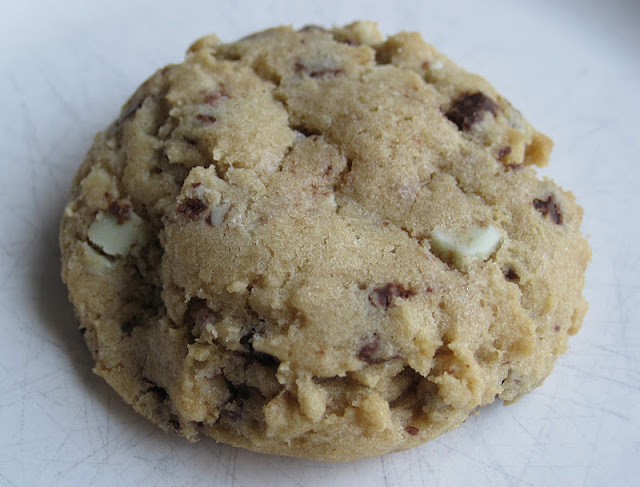 One of my first Christmas cookies was a mint chocolate chip cookie. The recipe was from my grandma. The cookies actually stayed in a round ball shape when they baked - they didn't spread out. 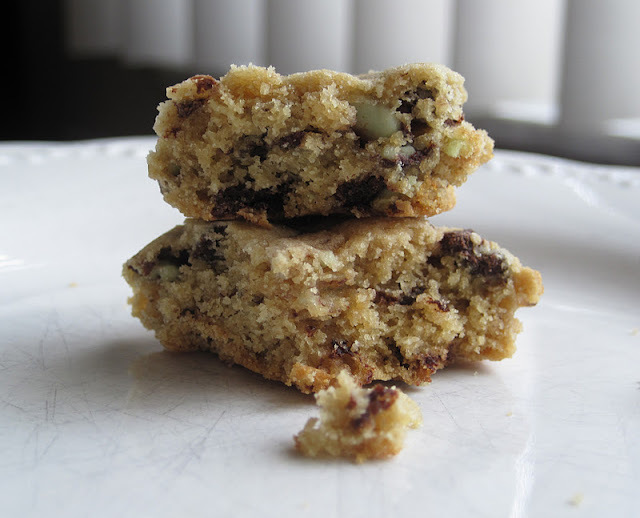 I'm not sure if you can even buy mint chocolate baking chips these days, but back then, every holiday season, bags of mint chocolate baking chips would magically appear. Look at those little green bits! Minty goodness. SP mixed together the dough before he left for work Monday morning. 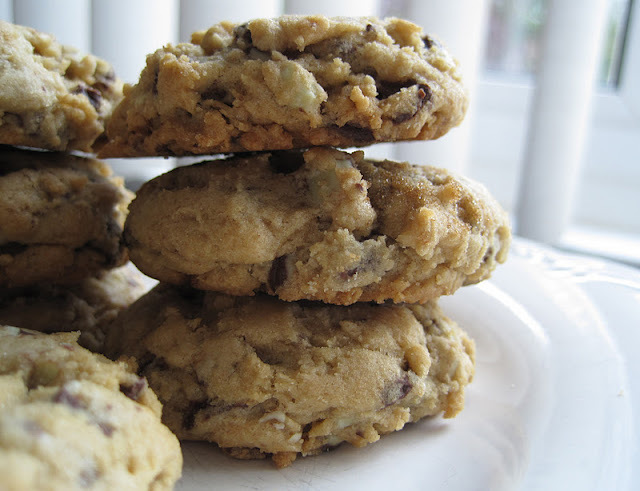 Before he left, he warned me that the dough for these is very crumbly. 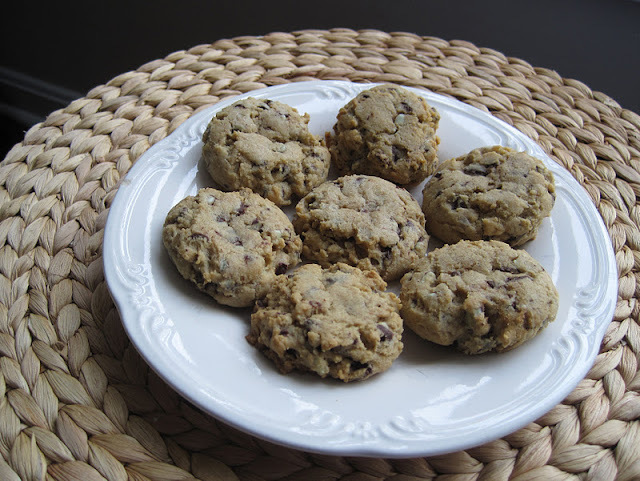 It uses dark brown sugar, not light brown sugar, and fortunately we had some leftover from the Triple Ginger Cookies. The dough is supposed to chill for an hour before you form 1 ounce balls that you then slightly flatten. The dough probably chilled nearly 2 hours. I used our cookie dough scoop and at first it was a bit tough for me to scoop. I ended up scooping a bit and then sort of packing in additional dough until the scoop was full. I used our dough tamper to slightly flatten them. 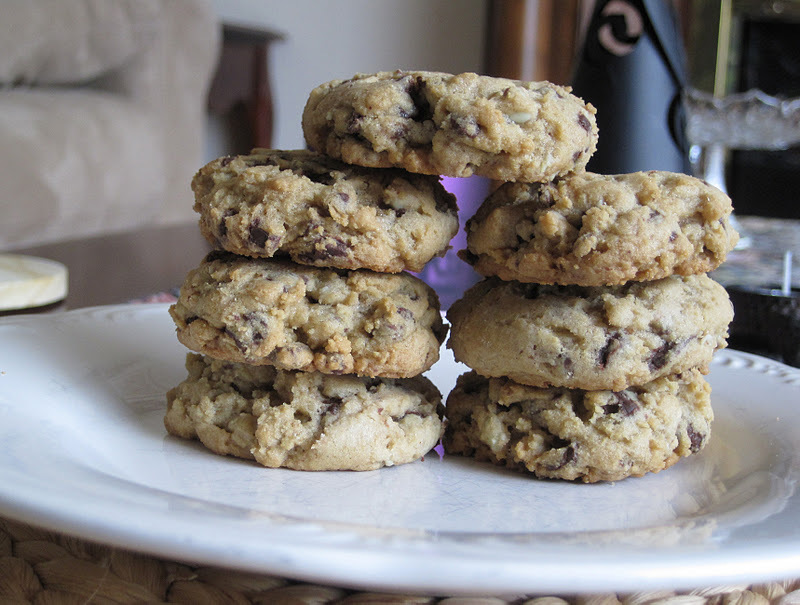 I baked them for about 11-12 minutes, more than the 8-10 minutes in the recipe. I don't think they are over cooked. In fact, these are pretty soft. They seem like a cross between a shortbread cookie and a chocolate chip cookie. With minty chocolate goodness. These are really good. Obviously, I have to sample the ones I break apart for the 'interior' photos. But I couldn't stop there. I ate quite a few. I love these cookies so much that I think we need to make another Walmart trip soon just to stock up on these baking bits. Also, I kind of want to try these Peppermint Crunch Baking Bits. 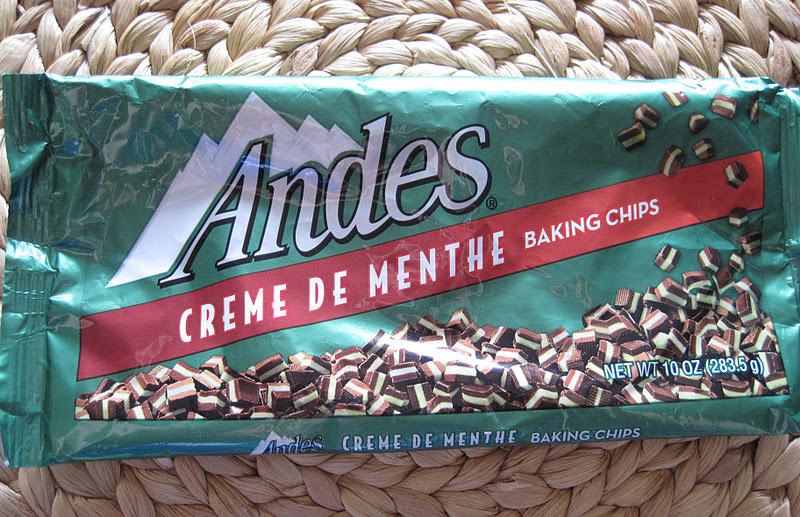 The recipe is on the back of the bag, or you can find it here: Andes Creme de Menthe Cookies.